October 31 marks the observation of Halloween or Hallowe’en, a short variation of All-hallow-even, the evening before All Hallows Day or All Saints Day, on November 1. After the Romans conquered the Celts in 43AD, they adopted many of their festivals and incorporated them into their own religious celebrations. All Hallows Day was one such example. Originally the day that celebrated numerous pagan festivals, but Pope Gregory III would eventually designate November 1 to mark the Christian feast of All Saints Day, which had moved from May 13. According to the Church, a day started at sunset, which is why celebrations typically started on October 31, the eve of the holiday, All Hallows Day. One of most poignant pagan celebrations was Samhain (pronounced “Sow-en,”) a Celtic holiday, which marked the end of the harvest and the end of summer. Samhain is sometimes also regarded as the “Celtic New Year.” Celts believed this was a very important day to celebrate, as this was the day when two worlds, the living and the dead, came together. Spirits were believed to be mischievous and caused trouble, sometimes damaging crops. So the Celts would leave food, gather together and set huge bonfires of burning crops, believing the light would drive away evil spirits away. Sometimes they lit candles or carved lanterns out of vegetables such as squash to light the way for good spirits. 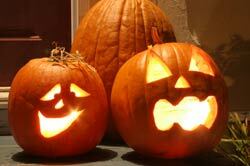 In the Americas, those lanterns would be carved out of pumpkins, also known as Jack O’Lanterns. There are also some accounts of people making animal sacrifices to Celtic deities and even dressing in costumes made of animal hides to fool evil spirits. These days, Samhain is celebrated more has a harvest festival but still uses many of the same rituals. In the mid 1800s, nearly two million Irish immigrants fleeing potato famine helped shape Halloween into an even more widely celebrated event. Scottish immigrants celebrated with fireworks, telling ghost stories, playing games and making mischief. There were games such as bobbing for apples, dooking, the dropping of forks on apples without using hands, and Puicini, an Irish fortune-telling game using saucers. Young women were frequently told if they sat in dark rooms and gazed into a mirror, the face of their future husbands would appear, however, if a skull appeared, the poor girl would be destined to die before marriage. The English observation of Guy Fawkes Day on November 5 had also become intertwined with Halloween. Most pranks and mischief were the work of naughty children rather than spirits as once believed. By the 1900s, the focus had shifted from a religious holiday to a more communal celebration. “Guising” was actually a practice dating back to the middle ages, when the poor would go around asking for food or money. 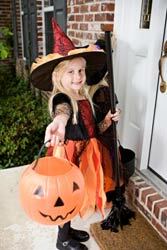 Borrowing from the English and Irish traditions, children adopted the practice of guising and would dress up in costumes, but there are only isolated references to children actually going door to door asking for food or money during Halloween. Instead parties were held and had a more festive atmosphere with colorful costumes. The frightening and superstitious aspects of Halloween had diminished somewhat, and Halloween in America was slowly shedding some of the old European traditions favoring more light-hearted celebrations. Despite the good natures of some people, Halloween pranks and mischief had become a huge problem in the 1920s and 1930s, mostly because the pranks often turned into vandalism, property damage and even physical assaults. Bad kids and even organizations such as the KKK, used the Halloween as an excuse to engage in criminal activity. Schools and communities did the best they could to curb vandalism by encouraging the “trick or treat” concept. The Boy Scouts got into the act by organizing safe events like school carnivals and local neighborhood trick or treat outings for children, hoping this would stir troublemakers away. But the Trick or Treat idea did face some controversy, as some parents and community leaders would take a stance that Trick or Treat was along the same lines as extortion, either the homes gave children “treats” or the families would be maliciously targeted with “tricks” for not complying. Regardless, by the late 30s, vandalism was decreasing as more and more children opted to partake in Trick or Treat. Anoka, Minnesota, a.k.a the “Halloween Capital of the World,” was the first city in America to officially hold a Halloween celebration, in an effort to divert kids from pulling pranks like tipping outhouses and letting cows loose to run around on Main Street. The town organized a parade and spent the weeks prior planning and making costumes. Treats of popcorn, peanuts and candy to any children who participated in the parade, followed by a huge bonfire in the town square. The event grew over time and has been held every year since 1920 except 1942 and 1943 when festivities were cancelled due to World War II. These days Anoka, holds elaborate Halloween festivals with a parade, carnivals, costume contests, house decorating, and other community celebrations, living up to its self-proclaimed title of “Halloween Capital of the World.” Salem, Massachusetts, associated mostly with witches due in part to its long and sometimes torrid history, also lays claim to the title. Many historians quietly back away from that debate leaving the two cities to duke it out for themselves. The popularity of Halloween has increased year after year. Television, movies, and other media outlets have helped Halloween grow into America’s second largest commercial holiday, which brings in an estimated $6.9 billion dollars annually. Watching horror movies and visiting haunted attractions, real haunts or haunted theme parks is a popular modern way to celebrate the evening. Just as it was in the colonial times, Halloween in America is a melting pot of everything that is Halloween. There is no correct way to celebrate the holiday. Overzealous religious and social organizations have unsuccessfully tried to squash the holiday by spreading lies or rumors hoping to tarnish the image of Halloween by associating it with evil. The truth is there are many unsubstantiated reports and rare attacks on ordinary citizens in the way of razorblades in apples or kidnappings and killings for Satanic rituals. Most myths are created to simply prey on human fears, sometimes for fun and sometimes to railroad thoughts and beliefs to serve the purpose of a select few. The biggest challenge facing today’s 38 million trick or treaters is staying safe in a world where the criminal types use Halloween as an excuse to act on deviant behavior. Many school and local communities will organize trick or treating in shopping malls, especially in neighborhoods where gang activity is prevalent. Parent worries in even the safe neighborhoods have adopted this practice as well. It saves money in the long run and is safe for all those involved and is slowly becoming the preferred way to celebrate in these volatile times. Some have argued that Halloween has lost its spiritual meaning due to all the corporate and media influences. In this technology driven world, it’s important to remember that along with society, even holidays are subject to evolution. No matter what people choose to do, no matter what cultural, spiritual or material way, as long as people celebrate in a safe and happy way, the spirit of Halloween in America will endure for ages. But it’s always nice to take a look back at history and learn how it all began.